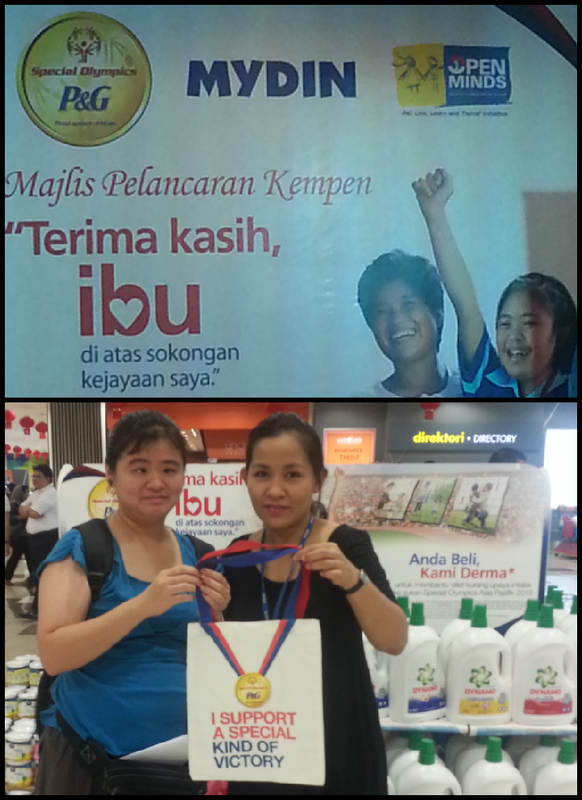 My Mom's Best: Majlis Pelancaran Kempen "Terima kasih, ibu di atas sokongan kejayaan saya"
Majlis Pelancaran Kempen "Terima kasih, ibu di atas sokongan kejayaan saya"
Above picture of me and Pn. Rafidah (Mydin). You are looking we holding the recycle bag. 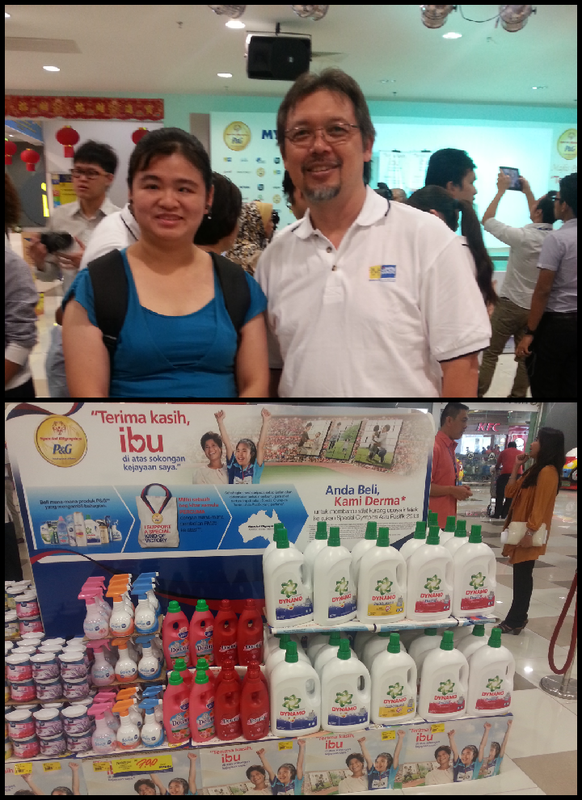 You can get the recycle bag free when you purchase RM25 products of P&G in MYDIN. On Saturday morning I was invited by Pn. Rafidah to P&G and MYDIN for this meaningful event. 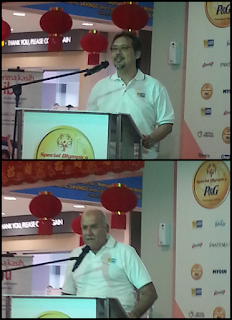 It is be part of Special Olympics Great Movement P&G and MYDIN call for greater opportunities for people with intellectual disabilities. What is Special Olympics? Special Olympics, it is an international organization that changes lives by promoting undersand, acceptance and inclusion between people with and without intellectual disabilities. Through year-round sports training and atheletic competition and other related programming for 2.8 million children and adults with intellectual disabilities in more than 180 countries. Special Olympics has created a model community that celebrates people's diverse gifts. Founded in 1968 by Eunice Kennedy Shriver, Special Olympics provides people with intellectual disabilities continuing opportunities to realize their potential, develop physical fitness, demonstrate courage and experience joy and friendship. 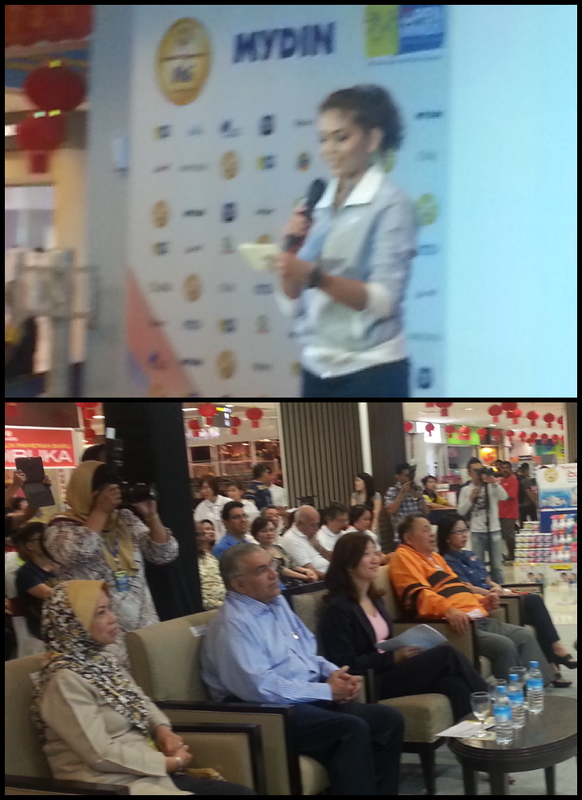 Emcee is Azura and front row seating the VIPS. 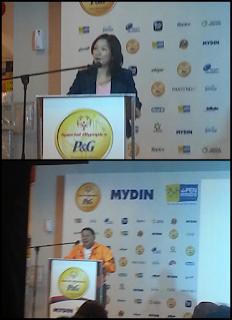 Below some pictures of Speech by Ms. Ellie Xie Country CEO of P&G Malaysia and Singapore followed by YBhg.Datuk Wira (Dr.) Haji Ameer Ali Bin Mydin Managing Director of Mydin Mohamed Holdings Bhd (not in picture). Then speech by Datuk Muhammad Feisol Hassan President of Specials Olympics Malaysia. 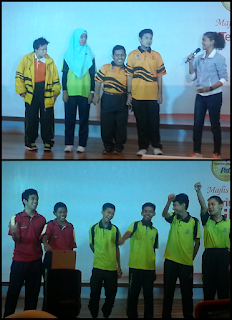 The Special Olympics atheletes were invited on stage. 14 year old Dehveyann was born with Down syndrome, a condition typically associated with delay in cognitive ability and physical growth, however this strong-willed boy is providing to all that the only limitation in anyone in the limit they set on themselves and for Dehveyann, the sky seems to be the limit. A condident swimmer and a hardworking athelete, Dehveyann is given a chance to represent Malaysia in the 1st Asia Pacific Special Olympics Games in Australia. 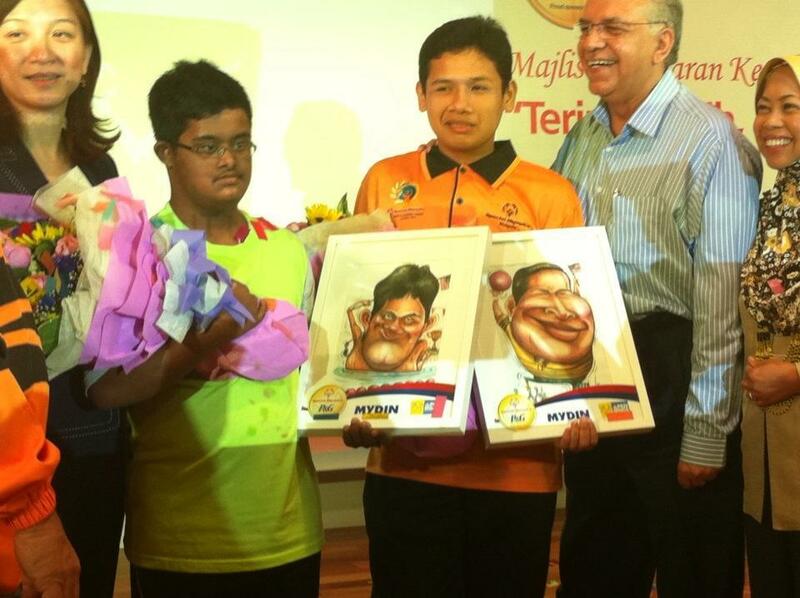 Above picture two special athletes Dehveyann (swimmer) and Zaim Abu Hirzan (bowler) will represent Malaysia in the 1st Asia Pacific Special Olympics Games in Australia this December 2013. Picture credit from Sidney Kan. Many special children, like Dehveyann, are discovering their potential and going beyound what they are commonly expected to through sports and Special Olympics is a place where not only they are given the opportunity to be active in sports but also interact with their peers in a supportive and enriching environment. 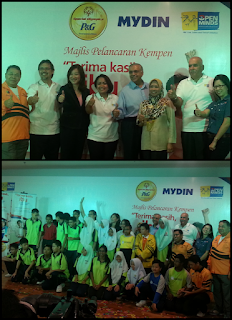 The happy faces and the true confidence that can be seen on these special children is an inspiration for Procter & Gamble (P&G) and Mydin Mohamed Holdings Bhd (MYDIN) to roll out a fundraising campagin. P&G and MYDIN aim to raise funds in support of our athletes' participation in the 1st Asia Pacific Special Olympics Games in Newcastle, Australia. Passionate in advocating a worthy cause, professional tenpin bowler Shailin Zulkifli, badminton coach Mohamad Razif Mohd Sidek and former national football player Datuk Santokh Singh who made apperance at the launch, will be conducting a motivational clinic for the special atheletes to boost their self-confidence. Above picture of Mohamad Razif Mohd Sidek and Datuk Santokh Singh. Before the event ends, a group photo of the VIPs and special Olympics atheletes. 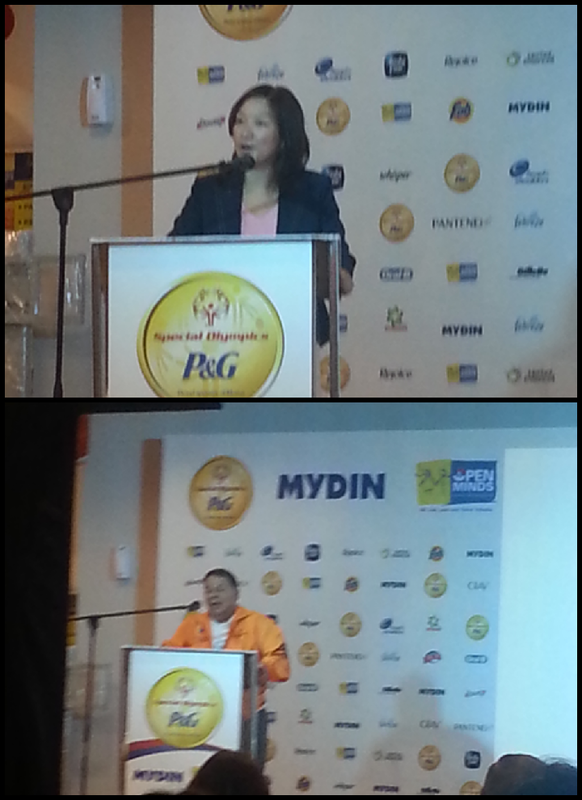 Starting from 23 Feb 2013 until 15 April 2013, consumers can help reach out the special atheletes by spending a minimum of RM10 on P&G range of products at participating MYDIN store. The campaign raises funds from sales of designated P&G products like Pantene, Head & Shoulders, Rejoice, Herbal Essence, Olay, Gillette, Oral-B, Downy, Ambi-Pur, Whisper, Febreze, Bonux, Dynamo and Fab. wow... you made it to the event :) Glad you had fun! !